Whether you want to heat up some toast, whip up an afternoon snack for the kids, or rotisserie your own chicken, the best countertop convection ovens can handle it all in a small space! We found 10 ovens that are perfect for small spaces or large parties, all while fitting your budget! Before we get into the countertop convection oven buying guide, here are some features to know about so you can find the best one for your cooking needs! Size: This refers to the number of cubic feet on the inside of the oven. Smaller convection ovens are great for snacks or small meals. If you want a convection oven for large meals or multiple trays, choose a larger oven. Power: Choosing the right power level for your cooking needs depends on what you want to do with your countertop convection oven. 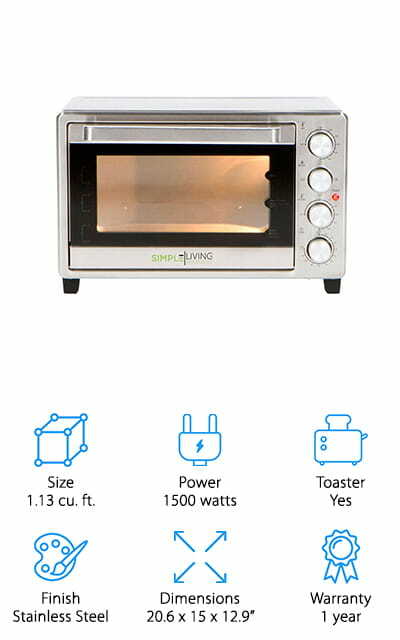 Less wattage is great for small snacks or toast, while more wattage can handle roasting at high temperatures easily! 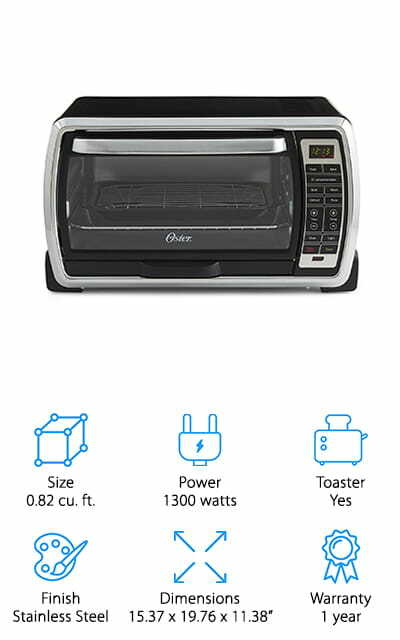 Toaster: If you plan to use your countertop convection oven for making a few slices of crispy toast in the morning, get a machine that can handle it! Most ovens can handle toast, but some are only for steaming or roasting. Finish: Sometimes, it’s nice to find an appliance that fits in with your other appliances or your overall design scheme! We let you know what finishes are available for each oven so you can choose the right style for your kitchen! Dimensions: If you’re working with a small space, pay close attention to the dimensions! We let you know the space each oven takes up, so you can find one that will fit into a small nook or slide perfectly under cabinets! Warranty: Any time you invest in electrical appliances, a solid warranty is a good sign that the company believes in their product! They will help you to repair or replace your oven, should something go wrong in the given time period. Now that you have a better idea of what kind of countertop convection oven you’ll need to buy, let’s get into the reviews! We found 10 of the best ovens for small spaces, large meals, and home cooks on a budget! Short on time? No worries! We started our reviews with our Top Pick and Budget Pick. Start there, and come back later when you have more time! Let’s find the best countertop oven for your kitchen and cooking plans! Our pick for the best countertop convection oven goes to this powerhouse smart oven from Breville! 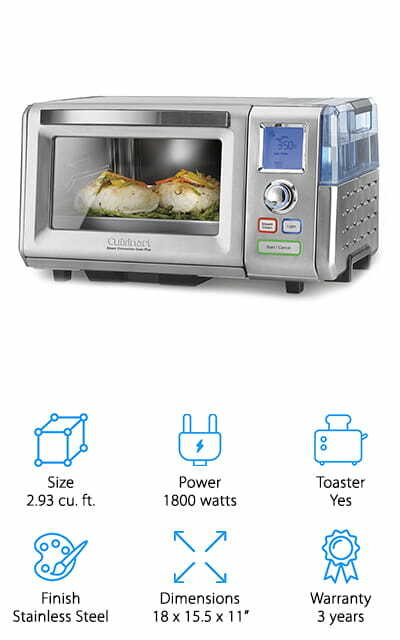 This convection oven uses a whopping 1800 watts to give you the range to cook a lot of different foods, from toasts to roasts! It has 10 pre-set cooking settings, so you can pick what you’re cooking, set the time, and let it do the work! The inside is large, and it can handle up to 6 slices of toast or a 13” pizza. We also like that cleanup is easy, thanks to a non-stick coating on the inside and a crumb tray below. All you have to do is wipe it down, and it’s ready for the next meal! The oven also comes with a broiling rack, baking pan, and pizza pan that fit perfectly – no need to buy special pans! We think this is a great convection oven for small spaces, or to give you an extra cooking space for large parties! Next up is our pick for the best inexpensive convection oven that’s perfect for small spaces! Even though it’s compact, this convection oven can still fit a lot inside! You can make 6 slices of toast for a family breakfast, and bake up a 12” pizza for dinner! We like that this cheap convection oven has all the convenient settings you need to make whatever food you like, without breaking your budget! The digital display allows you to use pre-set settings, or set the time and temperature on your own. The clear door and oven light also make it easy to keep an eye on things as they cook! Oh, and it’s super easy to clean! If you make a big mess, the baking tray and oven racks are all dishwasher safe, and the crumb tray is easy to slide out and wipe down. This countertop convection oven is compact, and fits well in small kitchens for additional cooking space! If you’re looking for a convection oven that fits your baking trays and casserole dishes, this extra-wide oven from Black+Decker is a great, versatile option! The extra-wide interior is 1.13 cubic feet, which is great for using with casserole dishes, 9”x13” baking pans, and up to a 12” pizza pan. You don’t need to buy special trays to fit, which is great for cooks on a budget! To get the perfect cookies, pizza, or lasagna, all you have to do is choose from one of 4 cooking settings: bake, broil, toast, or warm. You can also set the temperature or the 60-minute timer for more control. It comes with a crumb tray for easy cleaning, a baking/broiling tray, and toast rack that are all easy to use and clean! This is a great convection oven to use during parties, so you can free up your oven for bigger dishes, or to cook several dishes at different temperatures all at once! Do you want to buy a simple and compact convection oven that has everything you need to get started? 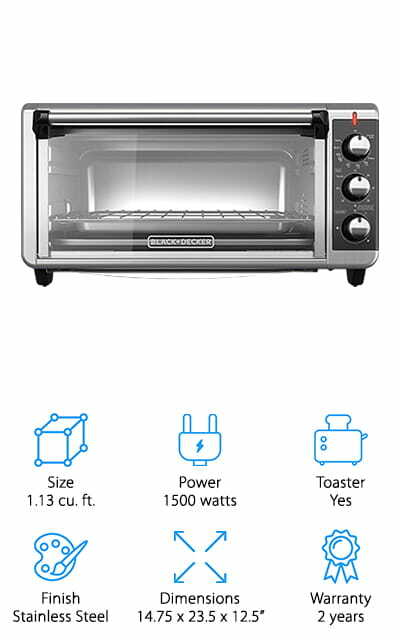 This convection toaster oven from Rosewill is easy to use, and comes with the basics to get you cooking! 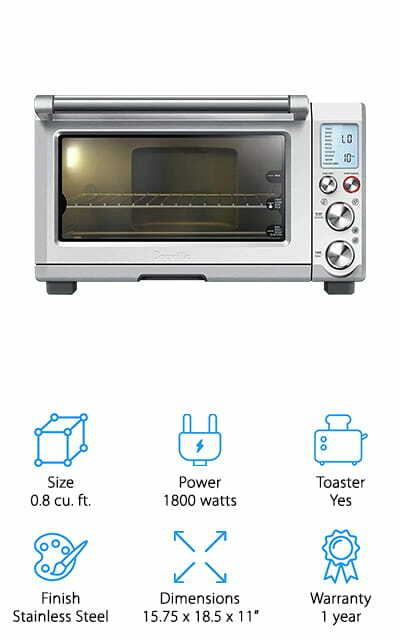 We like that this convection oven is simple for beginners to use. First, you choose whether you want to bake, broil, toast, or warm through your food. Next, just set the temperature and the timer, and you’re ready to go! We also like that it comes with everything you need to get you started, which is great for beginner cooks! It has a baking pan, crumb tray, drip pan, and pizza pan that fit perfectly and allow you to start baking cookies, toasting your morning bagel, or baking a Sunday roast for your friends and family! Whether you’re new to cooking, or an old pro in a tiny kitchen, this is a hard-working, easy to use convection oven for any home cook! When looking for the best countertop oven for baking, we came across this spacious and easy to use oven from the popular brand KitchenAid. This oven comes with 2 racks, so you can cook a lot of cookies, brownies, or bars all at once! The convection oven moves heat around evenly, so you don’t need to rotate or swap out the pans while baking. This is great because it prevents uneven baking or burning, even with finicky bakes! You can do a lot more than bake with this oven, too! You can bake, broil, and toast a variety of meats, breads, and snacks with ease! If you want to slow roast, you can set it to cook on low for up to 4 hours, with an automatic shut-off when it’s done! The interior is non-stick, and the drip/crumb tray slides out easily, so if you make a mess, just wipe everything down and your oven is ready for another dish! Next up in our countertop oven reviews is this combination steam and convection oven from Cuisinart! In addition to working like a conventional convection oven (Try saying that three times fast! ), this oven also has a steam function that gives you even more cooking options! 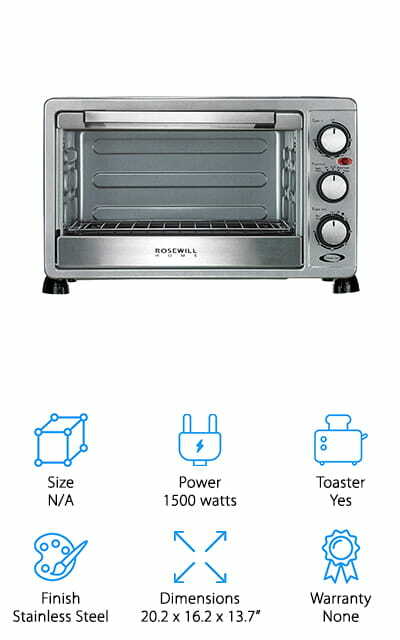 You can use it like a regular convection oven to roast, broil, bake, and toast your favorite meals and snacks. By adding steam, you can steam broil, poach, or steam meats, vegetables, and more to perfection for up to 2 hours without using extra oil, which keeps your meals healthy and lower in fat! 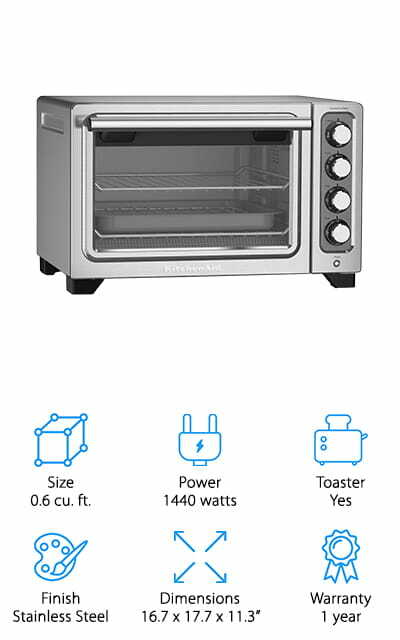 This is also a great convection oven for baking because you can use to proof your dough and bake it evenly much faster than a traditional oven. It even steams breads like pretzels, doughnuts, or steamed buns! If you want a professional-grade steam oven that fits in your small kitchen, definitely invest in this for all your cooking and baking recipes! 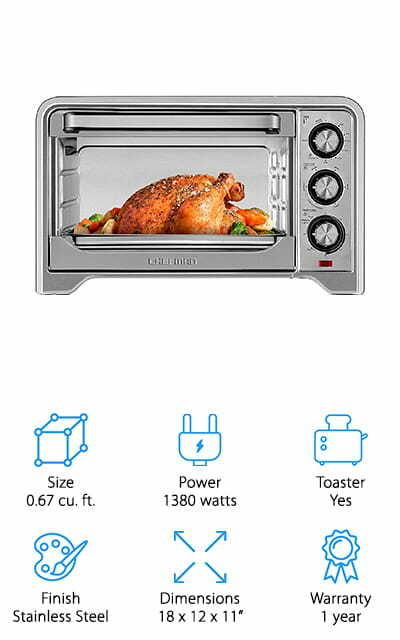 For the home chef who wants to learn to make their own rotisserie chicken or roasts, this convection oven from Simple Living lets you take your meat for a spin! 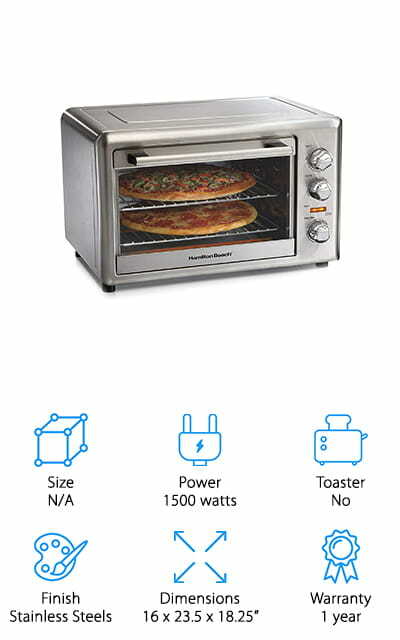 This oven has a large interior, and with 2 racks you can bake up to 9 pieces of toast or a couple of 12-inch pizzas in a hurry! You can toast, broil, and bake all of your favorite foods, just like in a regular convection oven. Our favorite feature in this oven, however, is the rotisserie function! A convection oven pushes around the hot air to provide even cooking, and the spinning rotisserie allows for more even cooking all the way around your chickens, roasts, vegetables, and more! It also comes with everything you need to get started, including a baking tray with handle, 2 wire racks, and the rotisserie rack with handle. This is perfect for the home chef who wants to impress during their next big family dinner! If you live in a small home or apartment, having a countertop oven that can handle all of your cooking needs is a major luxury! This versatile convection oven from Chefman can truly handle just about anything you throw into it! We like that it has all of the same broil, bake, and toast features of a convection oven, but it can do more! The temperature range is 75-450 degrees Fahrenheit, so it can even defrost or keep food warm, too! It’s easy to use, too! Just choose the cooking setting you want, set the temperature, set the timer, and go! If you want the oven to stay on longer for slow roasting or longer bakes, it does have an option to keep it on indefinitely. When you buy this oven, you also get access to Chefman’s exclusive online “Club Chefman” website that has video tutorials, hundreds of yummy recipes, and access to chefs who will answer your cooking questions! In addition to finding the best convection ovens, we also wanted to find the best countertop microwave convection oven for those who need a multi-function appliance! 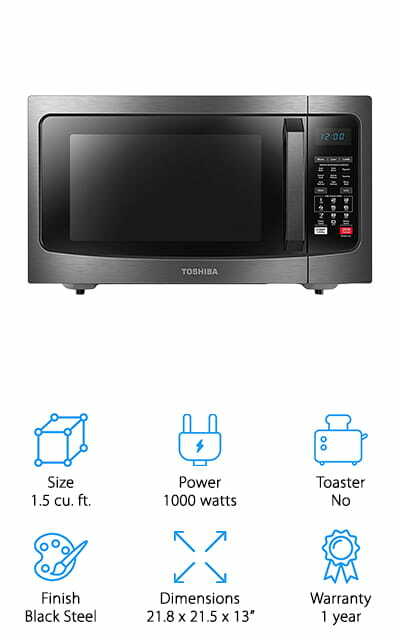 Instead of cluttering up your counter with a convection oven and microwave, this oven from Toshiba can do both! This all-in-one convection microwave is super easy to use, thanks to pre-set cooking functions for popular foods like pizzas, baked potatoes, popcorn, and more! You can defrost or warm foods in it, so you can prep faster or keep food warm while you work on something else. It gives you the option to microwave, using a spinning tray, or switch over to a grill rack when using the convection oven function. It’s also easy to program to a specific temperature or time, and even has a “favorite” option you can program for your favorite meals or snacks! We think this would make a great gift for a young home cook living in their first apartment! Our final review comes to us from Hamilton Beach, a well-known brand for making high quality kitchen appliances for the cook on a budget! This convection oven delivers without destroying your wallet! It’s a large countertop oven with two wire racks that can handle baking two 12-inch pizzas, a couple batches of cookies, or two casseroles at the same time! The convection heat allows for even cooking and baking, so you don’t have to worry about rotating trays halfway through baking cupcakes or breads. It also works as a rotisserie, so you can evenly cook a 5 lb. chicken, a large roast, or quickly broil vegetables for a healthy, quick weeknight dinner! It comes with 2 baking pans, a broiler rack, 2 wire baking racks, and rotisserie set to get you started with your new oven! We think this is the perfect oven to have around for the holidays to roast a turkey and bake cookies at the same time!